You can also subscribe to my channel on YouTube. Click below to receive updates on new videos! OK! I will give up on saying something very nice, just look sheepish and admit that I am one of those people who can't resist trying taters when it comes to appetizers /side dishes. Can't help it as potatoes are so versatile and I don't normally need to rush out to buy them. This month for Secret Recipe Club, I was assigned Cyndi's blog . I almost baked her coconut tart and chocolate cobbler but then I saw these delicious and easy Potato Bundles, Pioneer Woman's recipe. Yes!! Too simple for words and an easy guess, these are cubes of par-boiled potato tossed in herbs and seasoning, butter and cream ( yet another indulgent recipe from Ree Drummond! 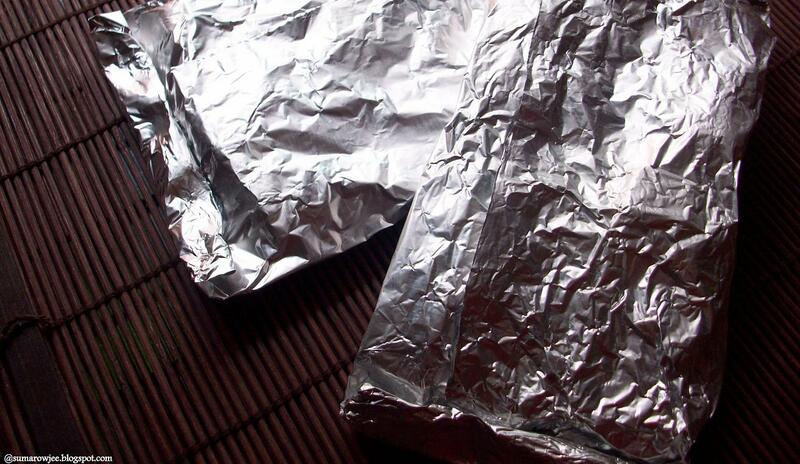 ), wrapped in pieces of aluminum foil and baked in the oven till tender. Served steaming hot right in the foil, makes for an interesting appetizer / snack as well. See it as a nice fuss free accompaniment to your simple week-day meal or a delicious after school treat for your kids or for entertaining. These taste great warm and good even cold. So this could go in the school snack-box as well! Me and kids went on a short trip to our home-town recently and I baked these potatoes on a whim late in the evening. For those travel hunger pangs which are triggered by the sight of food stalls on the platforms at the railway station, not to mention the sight of co-passengers who eat their meal in the train. Predictably, my just-fed kids were 'starving' the moment the train started to move. Since I did not want to delay their sleep time, I had to give them the snack. How I would have loved to wait for folk to open their tall dabbas filled with all sorts of delicacies before I opened my little snack. Kind of revenge you see - just to see if their noses twitch at the aroma of oregano, garlic, potatoes and butter. In case you are interested to know, I had no co-passengers with dabbas that day :(. But my kids enjoyed the potatoes thoroughly...now, who wouldn't unless its someone who hates potatoes? Here is the very simple recipe, play around with the herbs, fresh or dried, use your choice of spices to make variations. You can find Cyndi's recipe here and Ree's recipe here I have generally adapted the recipe, so the quantities Ree uses may be different. I guess these will taste good anyway as long as the potatoes are well cooked with enough seasoning and you do not skimp too much on the butter, so feel free to alter the quantities of the ingredients. A bit too much cream and longer baking time may make the potatoes a bit too soft, but they will certainly taste good! The quantities below worked well for me and I shall be using the same again. I have omitted the onion, par-boiled the potatoes briefly and then carried on with the rest of the procedure. Pre-heat oven to 190 degrees C / 375 degrees F. Boil the potatoes for about 3-4 minutes on high heat. Your potatoes will be fork tender, but not cooked. Drain. Cool. In a large bowl, mix together the cream, butter, garlic and the seasoning. Mix in the potatoes ensuring they are evenly coated with the cream-butter mixture. Cut pieces of aluminum foil. 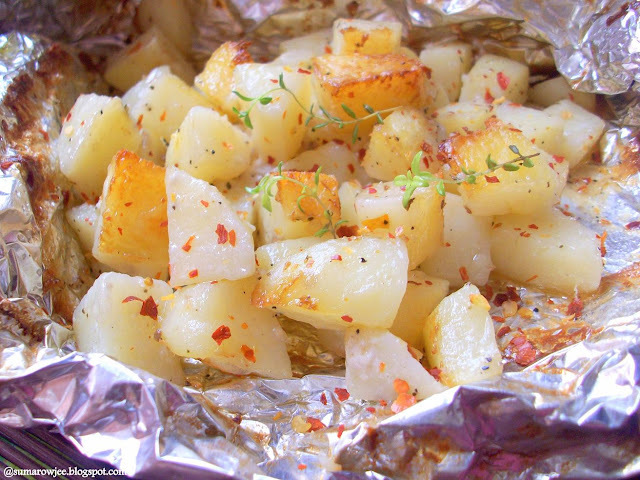 Place the potatoes in a single layer in the middle of the foil pieces, wrap very well (with an overlap of foil on the top), secure the ends well to make parcels. Bake for 45 minutes or till very tender. Serve in the foil. Open after about 5 minutes as there will be steam inside. The potatoes were tender, light golden at the bottom and very tasty! Thanks to Ree Drummond and to Cyndi, this will be a recipe I shall be making again and again! these look really good.....all the flavours are bang on...pw recipes are really good. Thats a lovely recipe...Potatoes are a huge favourite at home ! Quite a guilt free parcels, my kids will love this. I'm addicted to potatoes--seriously--and this is one of my favorite ways to eat them. The cream adds a decadent touch. We LOVE potatoes like this! Great choice for your SRC post! I can never resist potatoes! These sound perfect. yum, these sound awesome - i'm always looking for new potato recipes so i'll have to try these soon! Wowie, amazing it sounds :) The pictures are so so inviting !! U r awesome, Suma and thanks for sharing the recipe. I guess the 45 min cooking is also at the temp of 190'C only, right? I love potatoes, and the only potato appetizers I've tried and loved so far are the Potato Wedges from smtc.com and a Dum Aloo (chaat specialty from Calcutta) from another blog. Those look very very good! @BRed - Thank you! Sorry, have not used a stand mixer, so wouldn't be able to recommend out of experience. Those look so delicate and fresh! Cooking them today. 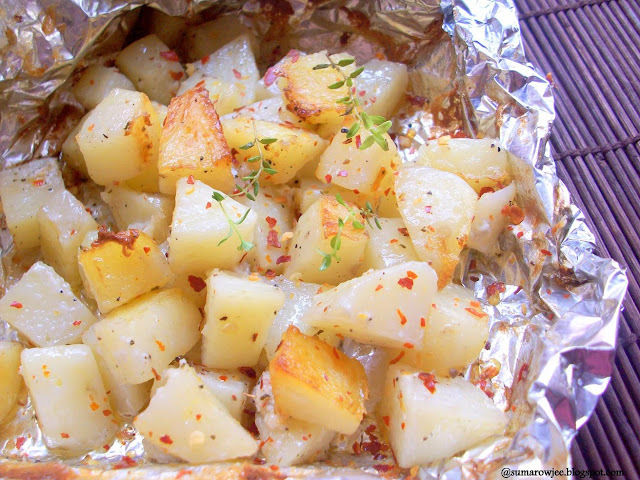 I was looking for a potato recipe that would not need loads of sauteing or frying.Love it! My kids love baked potatoes,will surely try this one.